2 organic squash (acorn, kabocha or butternut) Cut into 1 inch pieces. 1 bunch of fresh organic sage (finely chopped) Save a few whole leaves for garnish! Sauté onions in olive oil over medium heat until onions start to caramelize. Add vegetable stock, squash, potatoes, squeeze roasted garlic from the skin into the pot as well. Simmer until squash and potatoes are tender. Add sage, salt and pepper. 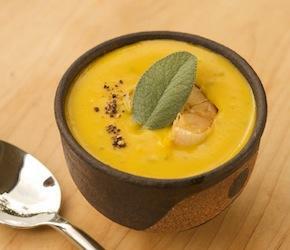 Purée the soup in a blender in small batches, garnish with a sage leaf and serve.